The Pet Adoption Tracker helps organizations understand their pets' exposure on the Internet. The Tracker provides both charts and raw data, and is available to you 24/7. 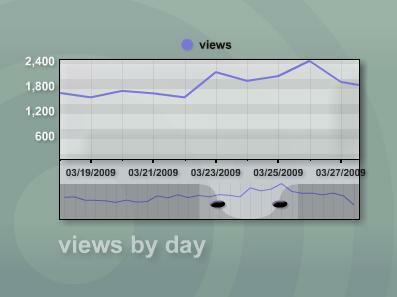 Although we do email weekly stats to you, you can view your Tracker stats at any time. The Tracker service is automatically included with all of the RescueGroups.org services, however it can be disabled at any time. The Tracker image can be added to any pet listing on any web site, including your own site or any pet or shelter management software that updates your pets to public web sites. 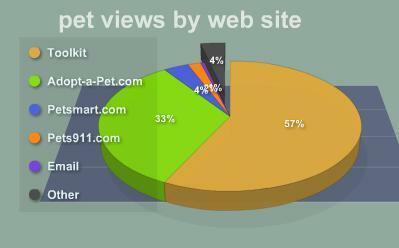 Which web sites are providing pet views? Shows the source of your pet views, including your web site, the pet adoption listing web sites, the Pet Adoption Toolkit, email clients, and other miscellaneous web sites. Which breeds are the most popular? Shows all of your pet breeds, and total number of views per breed. Which pets are the most popular? Shows all of your adoptable pets, and the total number of views per pet. How long since a specific pet was seen? Shows how many days it's been since each pet was seen on the adoption listing web sites. How many unique visitors have seen your pets? Shows how many unique visitors have seen your adoptable pets.